Posts related to Photoshop. Primarily tutorials and workflow suggestions with a little news and other interesting thoughts as they come along. Ok, so this tutorial is going to get a little more technical and theoretical, but I promise I’ll try to make it as easy as possible. To start with I’m going to describe what the Histogram is and why you should care about it (No really, it is your friend!!). Then we are going to dive into using Levels and Curves to adjust the tonal range in an image in order to enhance it. These are the very basics of image color and tonal adjustments. In Photoshop the Histogram represents the tonal value of every pixel in the image, so what you’re actually looking at is millions of little bars stacked on top of each other – each mountain peak is indicating where a relatively larger number of pixels fall in the scale from black to white. 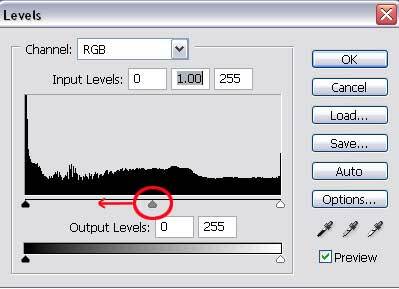 If you have a massive mountain jammed all the way to right in your histogram, it is saying that your image is predominantly composed of white or near-white pixels…which may mean it’s over-exposed. So is that bad? Well…it all depends really. Ultimately the idea of evening out the values across the histogram is just a suggestion and it’s up to you to decide what the image should look like, but understanding what the histogram is telling you can be a huge advantage in getting your images just right. High-key photos will be mostly leaning to the right while low-key images will have a greater proportion of dark pixels. The key is that you should still have a slight amount of information in the full range and the histogram will tell you if you are losing detail in any of the extremes. The bars are telling you where in the range from black to white the pixels in your image fall. Ok, now open up the Levels dialog and let’s start to do some adjusting. 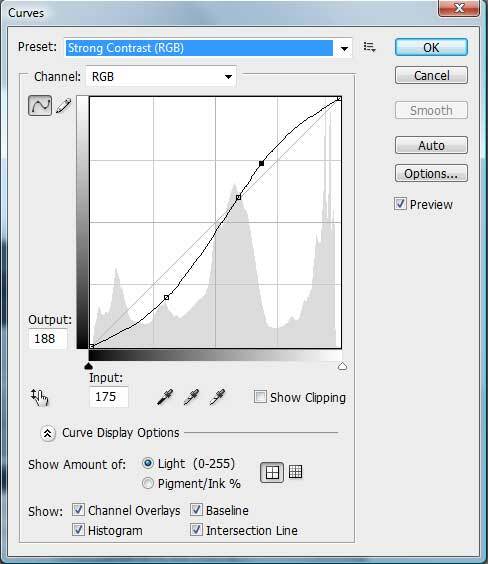 Make sure your histogram window is active (Window > Histogram) and then go to Image > Adjustments > Levels. 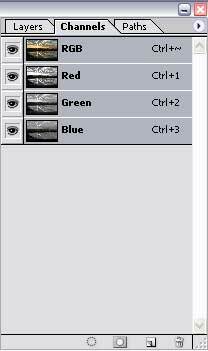 You’ll get a window that pops up with the Histogram in it and a few sliders along the bottom called Input Levels. You’ll also see a gradient bar with two more sliders that is called Output Levels. There’s also a Channels drop box at the top that we aren’t going to worry about for now (this basically lets you work on one color “channel” at a time). Grab the black slider underneath the histogram and slowly move it to the right while watching your image. You’ll see the gray boxes gradually grow darker. 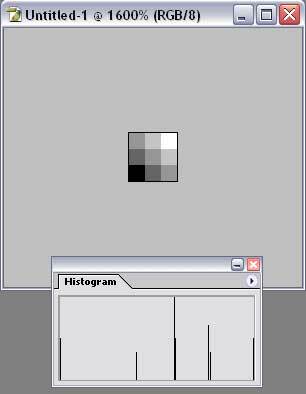 As you cross the first bar in your histogram, the two pixels next to your original black pixel have now become black. Cross the center bar and the diagonal row of gray pixels turns completely black. Keep going and eventually you will be left with just one white upper right pixel and everything else is black. Slide that back all the way to the left and then move it back to white again while watching your histogram update in the other window. You should see the gray bars slowly marching their way toward black. Return that slider to the left side and now grab the white slider. As you move this to the left the opposite happens – your gray boxes start to turn white!! Return that to the right side and pick the gray slider in the middle. As you move this left or right the grays shift darker or lighter and your histogram bars will cluster to the right or left, but you still keep the pure white and black pixels the same. So what’s that really doing? Well, those sliders tell Photoshop where to “map” black, white and middle gray in your image. If you open an image and it looks just mostly gray, you probably don’t have many black or white values, and pulling the sliders in essentially stretches the tonal range of the image to include more black and white (you’ll see this in the example image soon). Moving the gray slider will brighten or darken the image without destroying your shadows or highlights. The output sliders at the bottom have a slightly different effect. If you experiment with them you will note that they actually reduce contrast and fade the black or white values. If you slide the black slider left, your image will be all very light grays and white. I honestly very rarely use the output sliders except for a few very particular cases. Finally, you will notice there are three little “eye-dropper” tools in the Levels window. These are useful for quickly picking in your image where the black, middle-gray and white points should be. Pick the white eye-dropper and click on the center middle-gray pixel. You will see that all the middle gray and lighter gray pixels are set to white. If you click back on your original white pixel in the upper-right everything returns to normal. Go ahead and experiment with the eye dropper tools noting the changes that occur when you pick different points. Ok, cancel out of Levels and let’s try Curves. Go to Image > Adjustments > Curves. You’ll get another window with a diagonal line across it. This line is really just a graphical representation of the Levels you were just playing with. The output levels are your vertical axis and Input is the horizontal axis. White is the upper right point and black is in the lower left. You’ll also notice the same three eye-dropper tools. Make sure the Preview box is checked and then pick your white point and slide it to the left. You’ll see the same effect as when we moved the white slider in the Input section of Levels. Moving it down has the same effect as the Output Levels. Now pick a point in the middle and it creates a little box that you move around. Raise it up just slightly. This is the same as sliding the middle gray slider in Levels to the right – increasing the brightness of the image while retaining your white and black points. So enough messing around with little gray pixels…let’s try it on a real image! 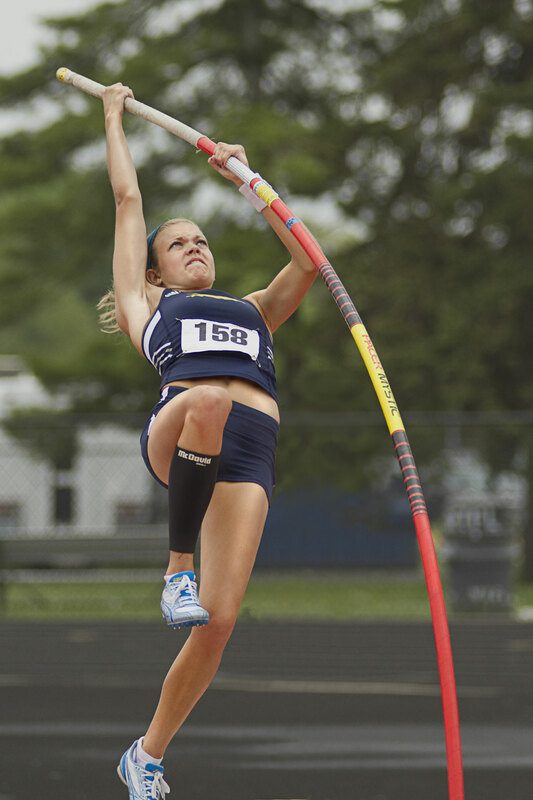 Load up the pole-vaulter picture at the bottom of this tutorial and convert it to grayscale (Hint: use an adjustment layer! Pick the split circle icon at the bottom of your layers window, select Hue/Saturation and then slide the Hue slider all the way to the left). You’ll notice that the histogram has a large amount of darker tones, but there is no black or white…everything is some value of gray (it was a hazy, overcast day when I took this shot). Let’s start with a Levels adjustment to expand the tonal range of the image (giving it full black and white values). Create another adjustment layer and select Levels. In the window pull your black slider to the right. As you go further to the right you’ll notice more and more of your image turning black until there’s nothing but the number card left. We really just want a hint of some black so leave it at a point where there are just a few pixels that have turned black (if you look at the number boxes I set mine at a value of 22). Now pick the white slider and bring it down until you just start to get some white pixels (I stopped at 233). Finally, you can use the middle gray slider to brighten or darken the image over-all. I tend to like darker images so I left it as-is. Click OK to accept the changes – Nice!! If you want to compare this to the original black-and-white image just click the little eyeball icon in the left column of your Levels adjustment layer. If you toggle this on and off you can see how the image has a fuller range of tone and the histogram also expands to fill the whole range. Ok, now say you want to make this a little more contrasty…really simple. 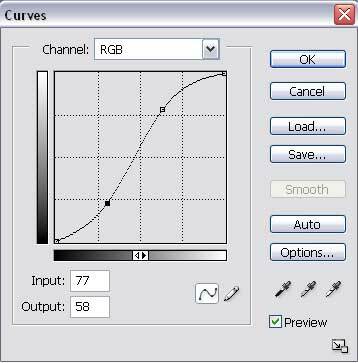 Create a third adjustment layer and pick Curves. Now just boost the highlights and pull down the dark tones creating the same “S” curve that we did in the earlier exercise. Presto! Feel free to experiment with the curves settings. You can add up to 15 points on the curve to adjust (I really can’t remember ever creating more than three or four…). When you’re used to how this works you can really do all the adjustments just within the Curves settings, but I wanted to show you how each tool could be used. When you’re happy with the way it looks, just for grins turn off the Hue/Saturation layer to see what this did to the color image. Whoa!!! You will probably see some pretty extreme color changes like bright red-orange legs. Curves adjustments do have one little tricky point – they will cause some color shifting and the more extreme your changes the more noticeable this is. The nice thing about adjustment layers is that if you want to change your settings, just double click on the layer thumbnail (the “graph box” part, not the title) and you can make new adjustments. What may have looked good in black-and-white will probably be too extreme for a full-color photo. Now that you have all these corrections done in adjustment layers, what if you wanted to do something like add a filter? You can’t really do this effectively to all these layers, so you need to “apply” this image to a new layer. Create a blank layer and then go up to Image > Apply Image (the keyboard shortcut for this is a little involved – Ctrl + Alt + Shift + E, or Cmd + Opt + Shift + E). This creates a new top layer with all your adjustments applied to it. You can then edit this the same way you would any regular image layer. Alright! 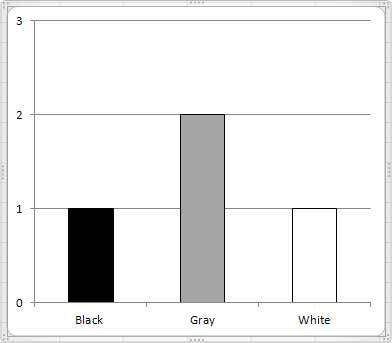 Hopefully you’ve got a good grasp of what the histogram is telling you about your images. One easy way to keep learning how this works is to load up some of your favorite pictures and see what their histograms look like. It doesn’t need to be a super high-quality image either…find some online that just have a good high or low-key look and see what their histograms reveal. Measure – I don’t know what it is, but I seem to have a built-in left hook when I’m taking had-held shots. Surprisingly consistent too. A lot of my pictures look perfectly straight in my brain when I’m shooting only to find that they are tilted about 1.4 degrees when I get them loaded on the computer. If you’re like me, here’s the fast and easy way to fix ‘em. Use the Measure tool…it’s buried at the bottom of the pop-out menu under the eye-dropper. Draw a line that matches a good horizontal or vertical line in your image then go up to Image > Rotate Canvas > Arbitrary. The correct amount and direction of rotation will be automatically filled in so all you have to do is hit OK and then crop the edges of the image. 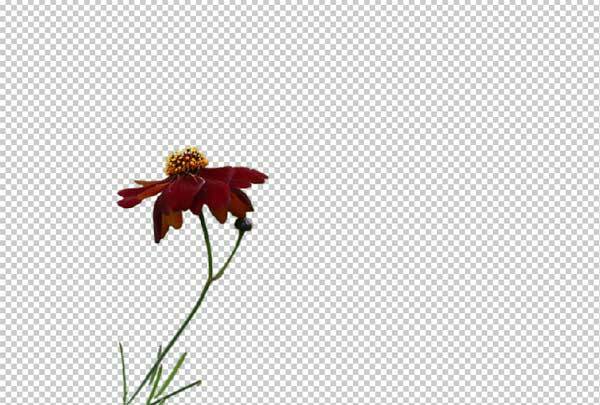 To keep the same aspect ratio of your original image, select the entire canvas with your crop tool and then drag from the corner control boxes while holding down the shift key. Curves – Instead of using brightness and contrast adjustments, use curves to make image tone enhancements. Create an adjustment layer (the diagonally split circle at the bottom of the layers window) and select curves from the list. Then create a slight “S” curve by dropping the shadow portion (the lower left side of the curve) and raising the highlights. Curves adjustments can work wonders on black and white photography too. Note: this S-curve adjustment generally works well in a number of “normally” exposed images. Different exposures will obviously require different adjustments. You can also get a funky cross-processed style effect by selecting the Blue channel and pulling the white point of the curve down and bringing the black point up…essentially “flattening” out the line just a little. Depending on the version of Photoshop you’re using you may have a range of presets available to quickly make some of these adjustments. I will have a fill tutorial on curves in the near future to dig deeper into using this tool. Raccoon Eyes – people with deep-set eyes often get dark shading in the eye-sockets…raccoon eyes. This tip will help brighten them up. Duplicate your original image layer (Ctrl/Cmd + J) and change its blending mode to Screen to brighten everything up. Add a layer mask and then mask off the whole layer by filling the mask with black. Using a soft edged brush, paint white in around the eye sockets, letting the lighter layer show through. Work with the layer mask and your opacity settings until the effect looks good with your image. Smooth skin – There’s a hidden filter that you may have played with and wondered what in the world anyone would ever use that for. In the filter menu under Other, you’ll find High-Pass. If you just run this filter you will get a funky grey image with some colored edges that just doesn’t look like it’s worth a knuckle hair, but the secret to getting something wonderful from this is to combine it with layer blending modes. Make sure you’re working on a copy of your original layer and then run the high-pass filter. Smaller settings create subtler effects…I usually use something around 3 to 6 pixels. Now go over to the layer blending mode and pick Overlay. 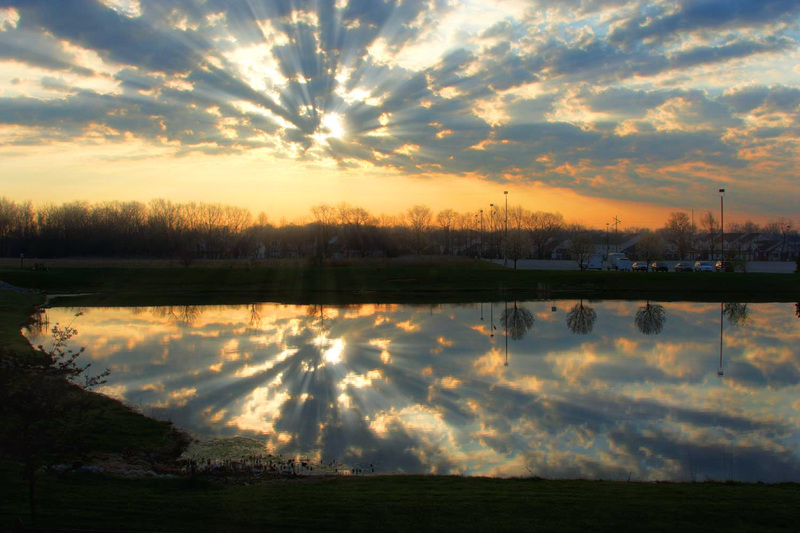 Suddenly you will see the image is given a good sharpening effect. This is pretty cool and can be quite useful, but to get a smoothing effect you need to click on the layer icon and then go to Image > Adjustments > Invert. This will give you a nice soft-focus look, again just as-is this is pretty cool, but if you want the photo to still be sharp add a layer mask and fill it with black, then paint white back in over the skin areas with a soft-edged brush while avoiding the edges around eyes and other features. Use the opacity slider to reduce the effect to a good level where there is still some detail in the skin. Reducing the “RED” in skin tones. – Sometimes, even if the color balance seems to be good people just come out looking a little flushed. If your photos seem to be giving uncle Roger a bashful blush, there are some pretty easy ways to tone it down. My favorite is to use a selective color adjustment layer. 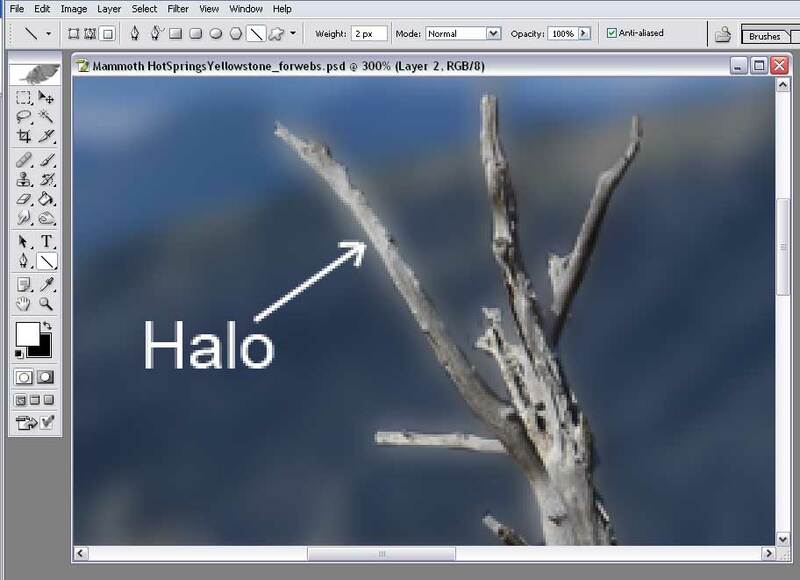 If you’re not familiar with adjustment layers there’s a quick tutorial (here). 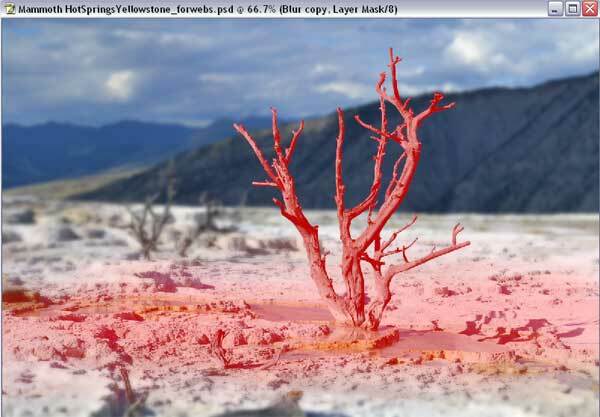 Open your image and add an adjustment layer, picking the Selective Color option. You’ll see an adjustments window with a drop box for selecting the color you’re working with and then sliders for adjusting the relative hues. Pick Red in the drop box and then drag the Cyan slider to the right until you think you’ve got a good cut in the red tones. you may also want to adjust the Black slider a bit too (usually to the left). Then, if you don’t want the change to affect the rest of your photo use the mask to paint out the areas other than your skin tones. You can also fade the effect by adjusting your layer opacity. One very powerful feature in Photoshop is the countless ways you can create and modify brushes. Just about any design can be turned into a brush and then “painted” into your image to create all kinds of effects. This tutorial will serve as a simple introduction to working with custom brushes. 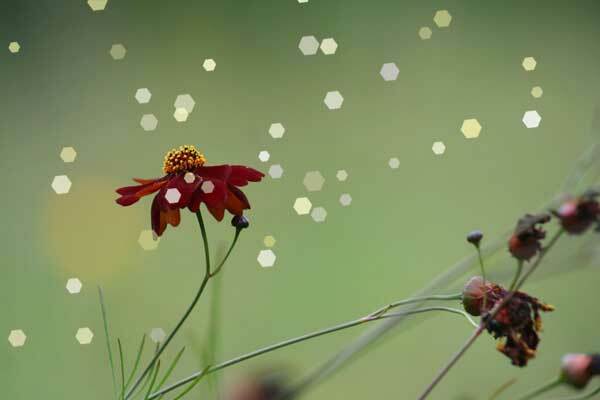 I was recently asked how to create a “bokeh lighting” effect in some images. Blurred little sparks of light in the background of some images can really be a neat effect. There are actually some plug-ins designed to create these lighting effects, but using a custom brush Photoshop will let you get a good effect without any extra plug-ins. To create a new brush shape, create a new layer and then pick the polygon tool (this is hiding in the pop-out set with the line tool). In the settings at the top enter 6 for the number of sides – you can play with this number…if you think about what creates “bokeh” it’s the shape of the aperture in your lens. The highlights we are creating will take on that shape. Now draw a little black hexagon somewhere in your picture. The size doesn’t really matter a whole lot – you can adjust this later in your brush settings. Depending on the version of Photoshop you’re using you may need to rasterize this shape to create a brush from it. Go to Layer > Rasterize > Shape and you’ll be set. Select this shape and then go to Edit > Define Brush Preset and name your brush. I called it Bokeh Light. Now select your brush tool (or just hit B on the keyboard). At the bottom of the brushes menu you’ll find a new brush with your hexagon shape. Pick that and let’s add some extra effects to it. In the Brusheswindow you will find a range of options for controlling how the brush acts when you use it. If you don’t see the Brushes window it may be one of the tabs hiding in the upper right, or just go up to the menu under Window and you’ll find it. Since we want a random scattering of hexagons with different brightness and opacity, there are a few options that need to be activated. Click on Brush Tip and slide the Spacing slider up to around 200%. Under Shape Dynamics set Size Jitter to 60% and Minimum Diameter to 20%. Under Scattering I ran the Scatter slider all the way to the right and checked the Both Axes box. Under Color Dynamics set Saturation Jitter and Brightness Jitter to 25%. Finally in Other Dynamics set Opacity Jitter and Flow Jitter to 30%. Whew!! That’s a lot of settings…and we barely even touched the possibilities in there! Really simple stuff, huh? There are countless ways you can use custom brushes in your images. My favorites are in creating textural backgrounds by creating a random shape, blurring the begeezus out of it and then mixing it in with layer blending modes. I’ve seen people use this same effect to create anything from heart-shaped lights for engagement photos to surreal atmospheric effects in composite fantasy images. Focus, Vignette and Sepia – three simple effects to enhance your photos. This tutorial will delve a little deeper into working with layers while giving you three really simple but cool effects for getting creative and artistic with your photos. 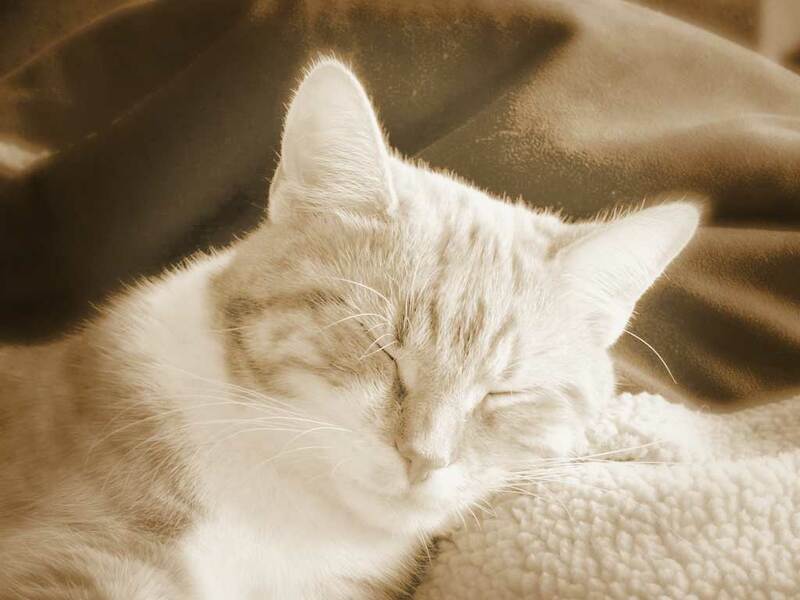 A very popular portrait technique has been to use a filter that creates a blurred edge effect with a focused center. I know some photographers who created this by smearing ring of petroleum jelly around a UV filter on the front of their lens. Well, Photoshop can give us a much less messy way to achieve this look. In addition to the blurred edges (sometimes called a focus vignette) we’re going to darken them as well and then finally give the image an overall sepia-tone treatment. 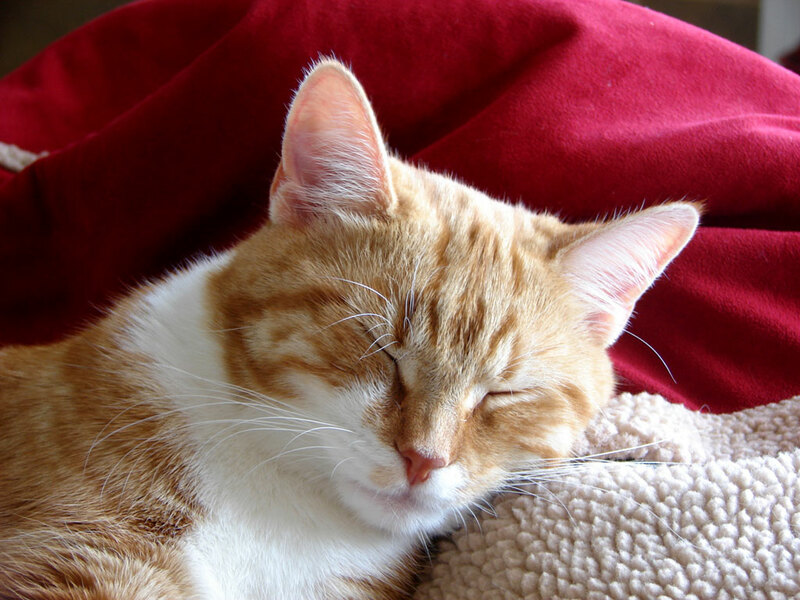 My cat, Copper, was more than happy to curl up and strike a pose for this project. Now, personally I love this image pretty much as it is, but I also like to create different looks depending on the project I’m working on. So let’s get a little creative with this one. Load up the original image from the end of this post (or one of your own if you have something you want to play with). Start off by duplicating the background layer (Ctrl/Cmd + J). Go up to the top of your toolbox and select the elliptical selection tool. In the tool settings along the top enter in a value of about 40-60 in the “Feather” box (the bigger the number, the more gradual your effect will fade out of focus). Then draw a nice big circular selection around Copper’s fuzzy face. If you’re not familiar with the “Feather” effect this is simply making your selection have soft faded edges rather than a sharp line. To actually see what this looks like, go over to your toolbox and just under the foreground/background selection boxes there are two buttons. The one on the right is a dark rectangle with a hole in it that lets you “Edit in Quick Mask mode”. Click this and you will see that your selection turns into a “mask” like the image to the right. 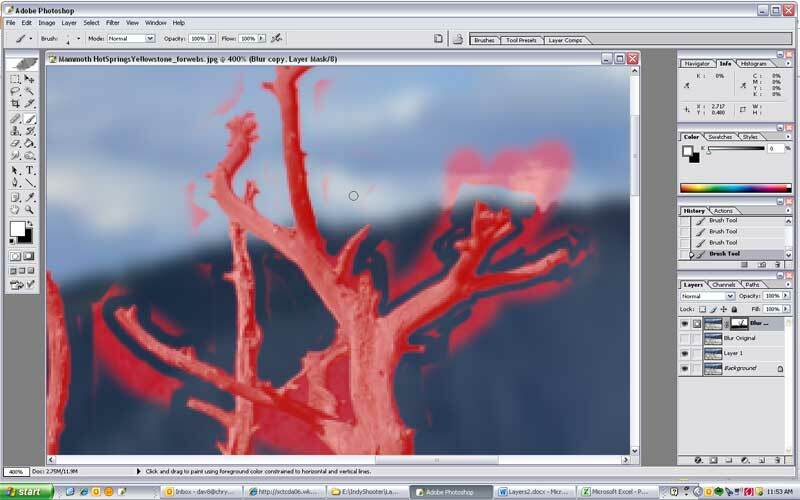 The selected area shows normal while the area that is not selected has been highlighted in red – the same as when we use layer masks to hide part of a layer. This functions the same way as the layer mask in that you can edit it with a black or white brush, gradient, etc. Once your selection looks right it will need to be inverted since we want to blur the edges, not Copper’s face! Go to Select > Inverse and you’ll see the selection flip. Now go up to filters and select Filter > Blur > Gausian Blur. Pick a good amount of blur – it’s ok if you think it might be too much because you can use the opacity settings on the layer to reduce this effect later if you want. I chose 8.5 pixels. Apply the filter and adjust the layer transparency to get the amount of blur you want. Viola! Can’t get much easier than that…nice blurry edges! Don’t turn off your selection just yet though (if you did, undo it!!) Let’s darken those edges just a bit to enhance the vignette. 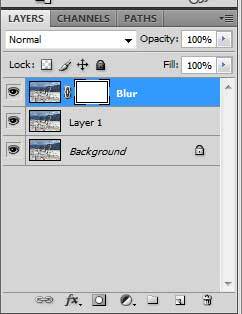 Create a new layer (click on the folded page button at the bottom of the layers window). Now grab the paint bucket and fill the selected area with black. You should get a solid black edge fading to a transparent center. To make this effect really work we need it to be more subtle. One of the most powerful features of layers is Blending Modes. These can be accessed at the top of the layers palette where you see the word “Normal” with a drop arrow next to it. Click there and you’ll have a big menu of options. Play with this as much as you want…with simple black layer we have right now many of them won’t look any different, but there are few options that will give a good look here depending on the image you’re working with. Overlay and Soft Light are two really good ones and if you want to reduce the color in the edges Hue, Saturation and Color at the bottom of the list will all have that effect (with a simple black layer like what we have here). For this image I picked Soft Light and then reduced the transparency of the layer to 78% (the shadows were just a bit too dark for my taste J). One little trick here – to quickly scroll through the different layer blending modes without clicking on each of them, go up and pick the Move tool from the toolbox and then double-click in the blending modes box so that it’s highlighted but not expanded. You can then use the up and down arrow keys to browse the different effects and see how they impact your image. Oh, and if you would rather have the vignette make the edges lighter – you want it to be white instead of black. Go up to Image > Adjustments > Invert. You may need to readjust the blending mode and transparency to get the look you want. Now to create a nice sepia-tone look we’re going to dive into using special layers known as Adjustment Layers. These nifty little things allow you to enhance the image you’re working on without actually altering anything permanently. If you were to boost the brightness and contrast of a picture by just applying it the image, you’ve changed the pixels in the image and if you decide to change this later you may run into some problems with degrading the image – if you boost brightness to the point where you lose some highlight detail, you won’t be able to get that back!!! With an adjustment layer you can change this at any time without these worries because the main image layer stays just the way it is. So without further ado, look down at the bottom edge of your layers palette and pick the split dark and light circle to create a new adjustment layer. In the menu that pops up select Hue/Saturation. To tone the entire image you want to select the “Colorize” check box and then slide the Hue slider until you get a nice brown color (36). Bring down the Saturation a bit to 31, and the Lightness to -4. These are just the numbers that I liked…feel free to experiment and make your image as crazy as you want it to be. Copper probably won’t mind if you really want to make him a purple kitty. Remember I said that you could go back and change these adjustment layers anytime??? Just double-click on either of the adjustment layers and you’ll see the corresponding dialog window open up again with the settings you selected right there. You can also see the original image anytime just by clicking the little eye icon in the layer to turn it off. Pretty cool stuff!! In this post we’re going one more step into understanding layers by developing a project around using a layer mask. The first layers tutorial had a brief little intro to them and now it’s time to start really getting a grasp of what they can do. This project may take a little time because there is some detail work involved. If you’re in a rush you don’t have to do all of the fine detail stuff – you will still get a grasp of what the layer mask is doing – but you’ll get a better image if you spend some time on it. Briefly, a layer mask is a grayscale image that “masks” the layer it is associated with. Think of painting your house. You mask off the trim to avoid getting color on it. The layer mask works the same way, where black is your “tape” and white is the color (or whatever is in the layer image). Black areas will show your lower layers while white keeps what is on the masked layer. Any greys will be partially transparent. Duplicate the layer. For many reasons…I always do this. It’s just a good habit. The beginning layers tutorial described a number of ways to achieve this, but the quickest is to hit Ctrl/Cmd + J. Ok, now for more excitement – do that again so that you have three identical layers. Double click on the name of the top layer and rename it to “blur”. Go up to Filters > Blur >Gausian Blurand select a good amount of blur (I chose 5.5). Add a layer mask by clicking on the layer mask icon (at the bottom of the layers window – it looks like a square with a hole in the middle). You should now have a nice little white rectangle “mask thumbnail” next to the image in your blur layer. You should get used to checking which part of the layer is selected – the mask or the actual image on the layer. 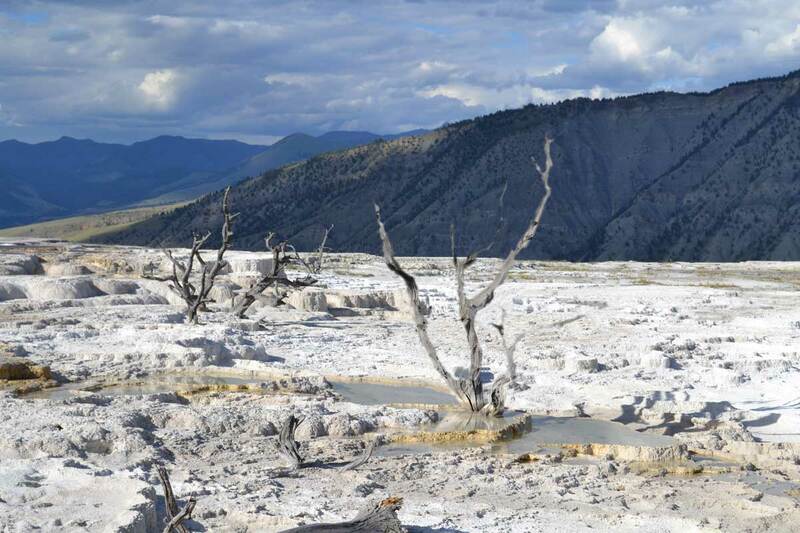 If you click on the image thumbnail, you will see a white border with black corners around it, indicating that the image is selected and anything you do will affect the image. Now click back on the white layer mask thumbnail and you’ll see the white and black border highlighting that thumbnail. Leave that selected for the next step – we want to work on the mask, not the image in this layer. Here’s where we start to have some fun. Grab the paintbrush and select a brush size around 6 and hardness of 85%. With the black foreground color and the “layer mask” selected, paint over the top of the blurred-out tree. You should see it start to re-appear in focus. If you look closely though, you’ll notice the edges of the tree have a strange “halo” look to them. This is because the blur filter doesn’t recognize those edges and will spread the tree out to blur it with the background. So how do we fix that? Go ahead and delete that blur layer and create another one (yeah I know, I really did just make you do something wrong 🙂 ) Don’t apply the blur filter just yet. 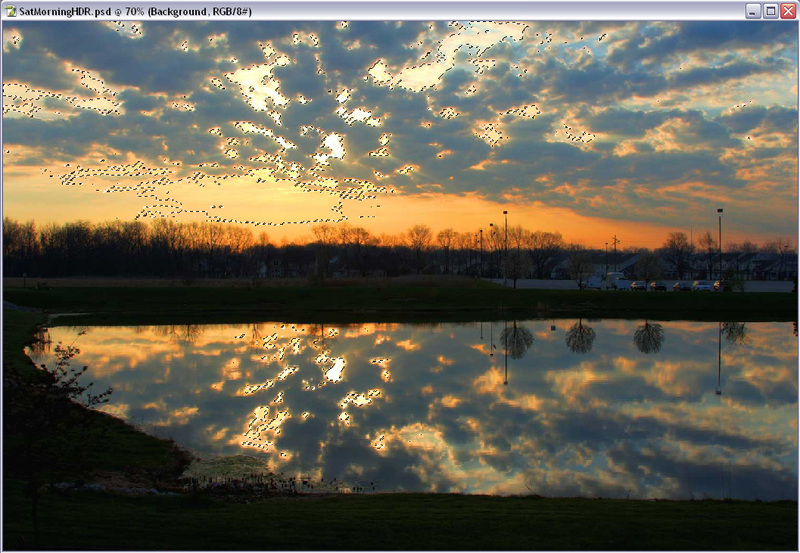 If you have CS5, there’s an awesome little tool called “content aware fill”. This will let you select around the tree and fill it with background really easily. I’m still stuck with CS4, so I’m going to do the old-fashioned clone stamp method. As soon as I can get an upgrade I’ll give some more details on the fill tools (yeah, love having to budget this stuff…). Ok, so since we are going to just blur this image you don’t have to be super-accurate in this, but use the clone stamp tool to copy the background over the edges of the tree. You don’t have to completely erase the tree…just enough so that when you blur it you won’t see those fuzzy edges coming through that mask. 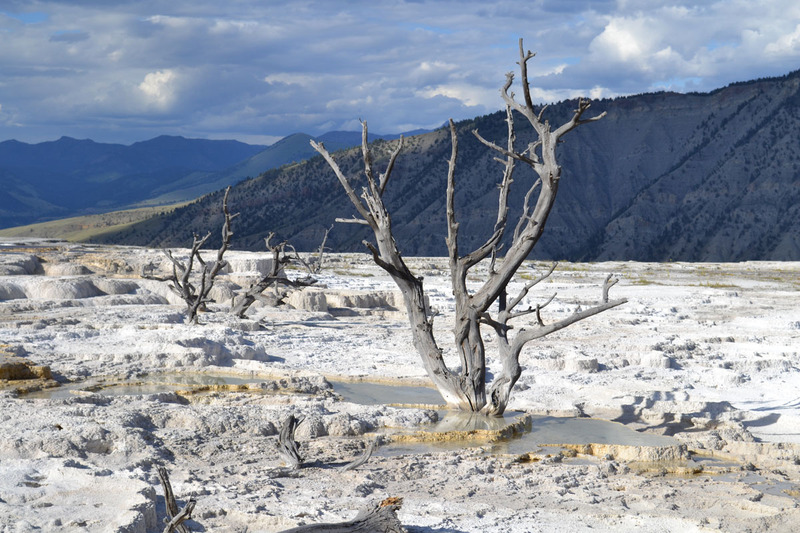 If you’ve never really used the clone stamp tool before – it’s the one just underneath the paintbrush that kind of looks like an old wood handled rubber stamp. Basically, It copies one part of your image to another. Hold the alt key down and click somewhere in the mountain range near the tree. Now move over and click and “paint” along the edge of the tree. You should see that you are copying the part of the mountain you selected over the tree. This can get a little tricky where the mountain meets the sky, but by centering your cursor on the boundary between mountain and sky to alt-click and then moving over to the tree and still centering the cursor on that same boundary, you should be able to get a pretty good effect. This is what my layer looked like after this step. 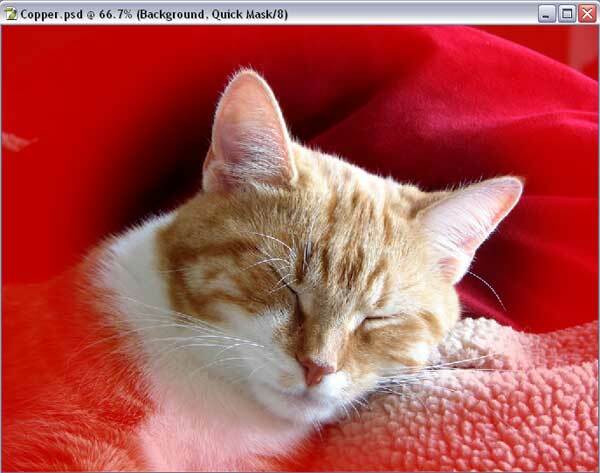 Once you have that done, go ahead and apply the Gausian Blur filter and create a mask and start brushing in the mask as described earlier in step 3. You should now be getting nice crisp edges on your tree. Here’s the neat thing about the mask…you can easily undo anything you’ve masked by switching your color to white! Try it – select white as your color and brush over some of what you’ve been masking. You should see it go all blurry again. So, by switching between black and white and changing the size of your brush (another keyboard quickie – using the bracket keys “[“ and “]” will reduce or enlarge your brush size respectively) you should be able to mask out the tree from the blurred image. This is the detailed part of the project that I was talking about. If you don’t want to spend the time doing it all, that’s fine. Another keyboard shortcut I use a lot in this process is the X key. This swaps the foreground and background colors…so you can switch between black and white just by hitting X. You might be thinking that you’re not entirely sure if you’ve got something masked or not – well, Photoshop has a handy helper for that. Hit the backslash “\” key, just above the enter key. Your masked area will show up highlighted in red. If your image had a lot of red tones in it you could change this highlight color by double clicking on the layer mask thumbnail. Hitting the backslash key again will toggle the highlight off. I actually find it easier to mask off more than I need and then go back in with the white to unmask up to the edges of the tree. Once that is done I’ll go and clean up the rest of the mask. In this image you can see that there is a lot of “extra” mask (the red) but the edges of the tree have been cleaned up. Now if you think about how a large aperture in your lens gives a shallow focal plane, you will know that the tree isn’t the only part of the image that should be in focus. The ground that is the same distance from the viewer will also be in focus. To create this effect select a larger brush (somewhere around 70-100) and brush a black stroke across the image through the base of the tree. Now reduce the opacity of the brush to around 25% and slowly expand that stroke into the distance and toward the bottom of the image. Reduce the opacity even more to 10% and really gently feather off the mask in the distance. Don’t forget to use the mask highlight “\” to get a good visual on how this is going. When you’re all done you should have a nicely blurred background and the tree and ground surrounding it will be in focus. This is what the highlighted mask should look like. Just to show off a little more of the power of layer masks, select the first Layer 1 image and let’s do a slight color enhancement to it. Go up to Image>Adjustments>Curves and slightly enhance the shadows and highlights. It’s ok if you’re not familiar with the curves dialog – I’ll go over that in more detail later – but for now just click in the upper right part of the line and pull it slightly higher and then click in the lower left section of the line and pull it slightly down until you have a curve that looks something like this. If you have the “Preview” box selected you will actually see the contrast in the tree change. If you would like, feel free to play with the curve and see what effect it has. 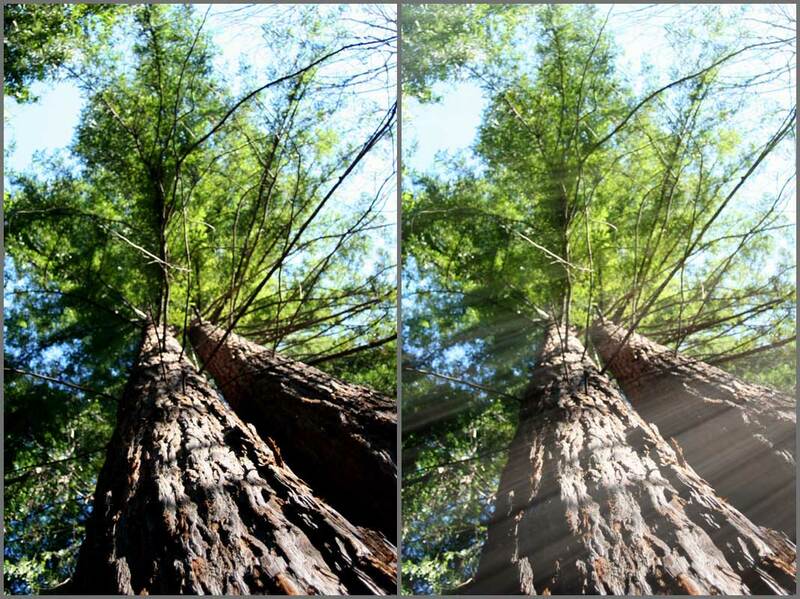 You should notice that the masked “blur” layer doesn’t change – just the layer with the tree that is showing through the masked area. This ability to adjust color and tone of one layer without affecting the rest of the image is one of the really powerful features of layer masks. 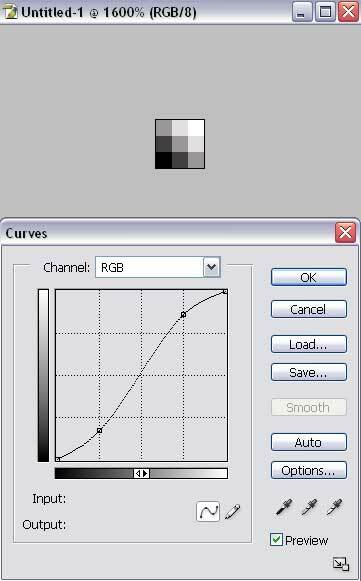 You can do the same to the blurred layer – select it and do a curves adjustment on that. Congratulations! 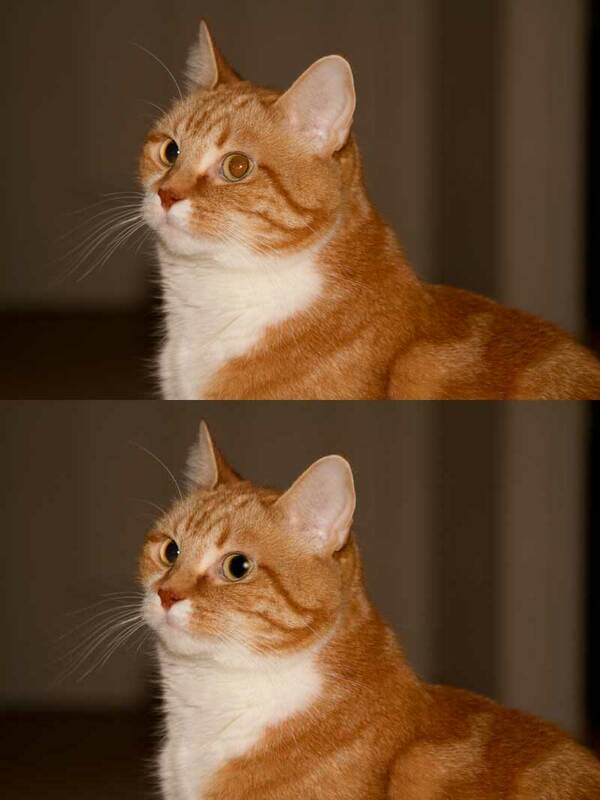 You just created a blurry background for your picture by using layers and a layer mask. There are a lot of possibilities for using masks like this. Another very common photographic effect that can be accomplished with a layer mask is having one item in a picture be in color while the rest is black and white. Look for a quick-bit tutorial soon to see how that’s done if you need help! 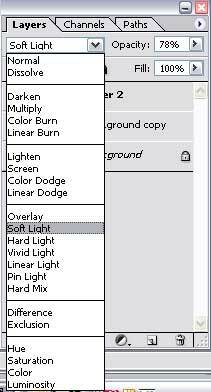 Hey everyone, this is just a quick bit related to using layers in Photoshop: Consider making it a habit to duplicate your background layer as your first step in editing any photo. I never do any alterations directly to the original layer. You never know when you’re going to need those pixels just the way they were. During the course of retouching or really getting artistic in a project, you may find there was something back in the original image that you want back. There are ways to re-open and import the image, but it’s just easier to have it sitting at the bottom of the pile, untouched. I also frequently will do a quick before/after check if I’m retouching portraits to make sure that I haven’t gone too far with a particular edit…trust me, it happens and you can make your subject look really kinda creepy pretty quick if you aren’t careful. So as soon as I open an image I hit Ctrl/Cmd + J (by the way – for those who may not know what that is, it’s shorthand for holding down the control key on a PC or command key on a Mac and then pressing J). There are other ways to make a duplicate layer which were covered in my beginning tutorial on layers (here), but the “J” key shortcut is nice and quick. That’s all for this post. Happy shooting! !